FARMINGTON — Being motivated, finding your niche, having goals and a positive attitude are key to overcoming adversity, retired Army Staff Sgt. 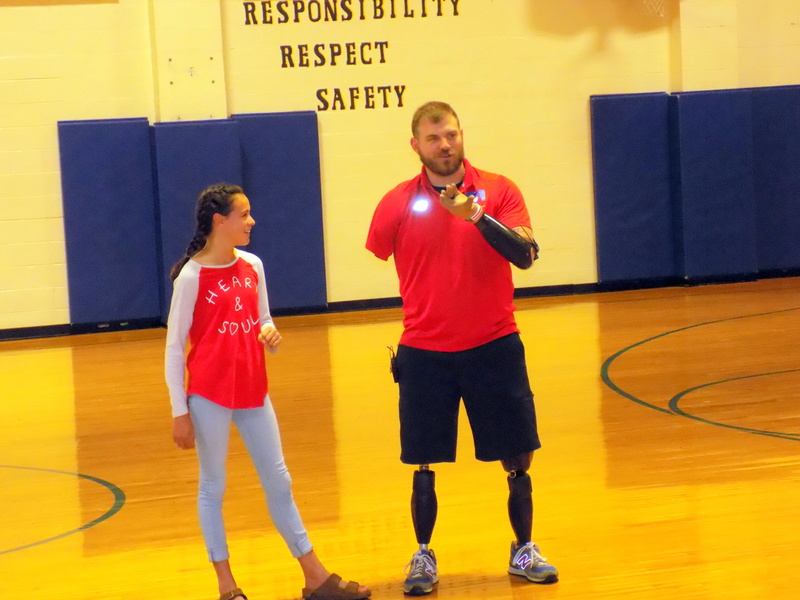 Travis Mills told students at Mt. Blue Middle School on Thursday morning. 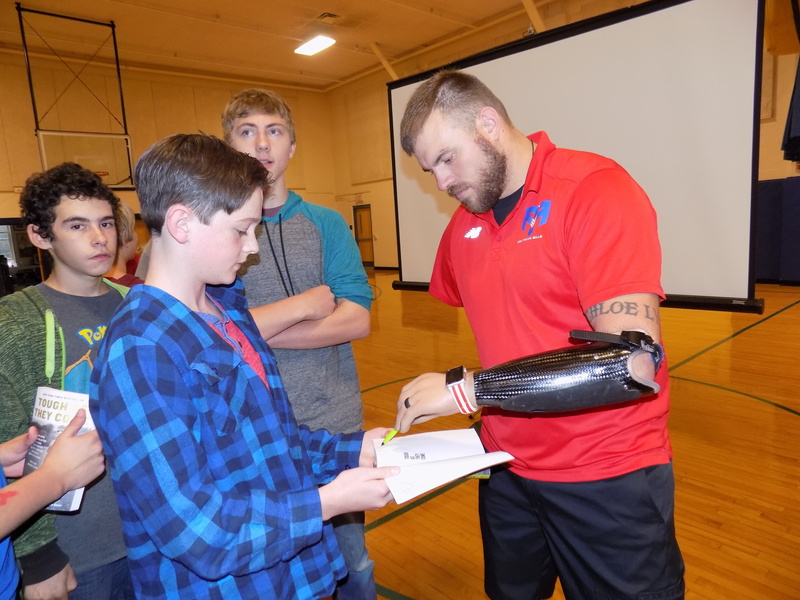 Mills, who lost limbs in a bomb-searching mission in Afghanistan in 2012, said he hoped he wouldn’t “bomb” his presentation Thursday, eliciting groans from listeners. He said the explosion during his third deployment threw him on his face and when he looked, his right arm and leg were gone, his left leg and arm injured. He said once the medics got the bleeding stopped, he was put on a stretcher and flown by helicopter for surgery. Mills was transferred to a hospital in Germany on April 14, 2012, his 25th birthday. He asked if he was paralyzed. His friend Josh Buck, a medic, told him he was. “I was angry, embarrassed, upset,” Mills said. Three days later Mills arrived at Walter Reed National Military Medical Center in Bethesda, Maryland, where his wife, Kelsey, saw him for the first time. “The next day I told her this isn’t what you signed up for, what you want,” he said. Mills talked about becoming motivated for his wife, who is Buck’s sister, and their daughter, who was born in 2011. He said he couldn’t roll over or sit up, and he faced a long road to recovery. But he set short- and long-term goals. He wanted to give back. The Travis Mills Foundation was created. Mills said he biked down a 9,000-foot-high mountain and later learned to water-ski and snowboard. Those experiences led to the Maine Chance Lodge & Retreat in Mount Vernon where amputees and their families visit for a week at no cost. The facility in the Belgrade Lakes region was built in 1929 by cosmetics pioneer Elizabeth Arden and was once part of Arden?s estate spanning 1,200 acres, according to travismills.org. “We show them life goes on, and how to do things,” Mills said. “I get to do a lot of fun things. I don’t say this stuff ’cause it sounds good. I am a happy person, glad to be alive,” he said. • While every situation can’t be controlled, one can always choose a positive attitude. Responding to questions, Mills said he has changed a lot of lives and is grateful for the opportunities he’s had. “It’s selfish, but I would take my arms and legs back in a second to play with my daughter and, now, my son,” he said. Mills’ visit was made possible through a Drug Free Communities Grant for Franklin County and the River Valley through the Healthy Community Coalition. It was part of the Healthy Community Coalition’s Substance Abuse Initiative. Mills was scheduled to speak at Mountain Valley Thursday afternoon. Mt. Blue Middle School Principal James Black said Mills’ talk was the culmination of Red Ribbon Week, which focuses on drug abuse prevention. On Friday, students can pay $1 to wear a hat to school. All proceeds will go to the Travis Mills Foundation. An open house at Mills’ facility in Mount Vernon is set for 11 a.m. Saturday. Fore more information go online to travismills.org.